The following blog post comes to us from Paula McElwee, Technical Assistance Coordinator with Independent Living Resource Utilization (ILRU) based in Houston, TX since 2012. Lately I have had even more questions than usual around the difference between advocacy and lobbying. I will address lobbying more specifically next week, but before I do I want to talk about advocacy. Let’s start with what we must do instead of what we can’t do with federal dollars. (iii) Oneself, in which case it is self advocacy. The very core of a Center for Independent Living (CIL) is a mission to enact social change related to people with disabilities. If we are going to continue to see change for the better in our society, we must speak out about injustice. When our key civil rights legislation — the Americans with Disabilities Act (ADA), the only civil rights legislation that passed with bi-partisan support — is attacked by the congress, we have a role in describing both the positive impact under the law and the negative impact without it. Let me say again, this can be done without lobbying, and we are required to do it. The strategy used to pass the ADA included town hall style meetings where people from every state had a chance to express the discrimination they faced day to day. People wrote “discrimination diaries” and shared them in testimony at the state level and before congress. The nation-wide, blatant discrimination became so obvious that the nation knew it had to pass a law to guarantee the civil rights of people with disabilities. Those town hall meetings, where people told their stories, were not lobbying. Advocacy can include public education, policy research, position papers or statements on issue, get out the vote efforts, coalition participation or building, litigation and boycotts along with direct action such as that led so ably by ADAPT at the local and national levels. All of these things are allowable for centers as part of the required service of advocacy, and it is permissible to pay for the time and cost of doing this through the federal funds in your grant. Advocacy can also include lobbying, both direct and grass roots, but these activities cannot be paid for with federal funds. Direct lobbying refers to attempts to influence a legislative body through communication with a member or employee of a legislative body, or with a government official who participates in formulating legislation. Grass roots lobbying refers to attempts to influence legislation by attempting to affect the opinion of the public with respect to the legislation and encouraging the audience to take action with respect to the legislation. In either case, the communications must refer to and reflect a view on the legislation. But as I said, more about lobbying next week. Remember that CILs must advocate. It is a required service. 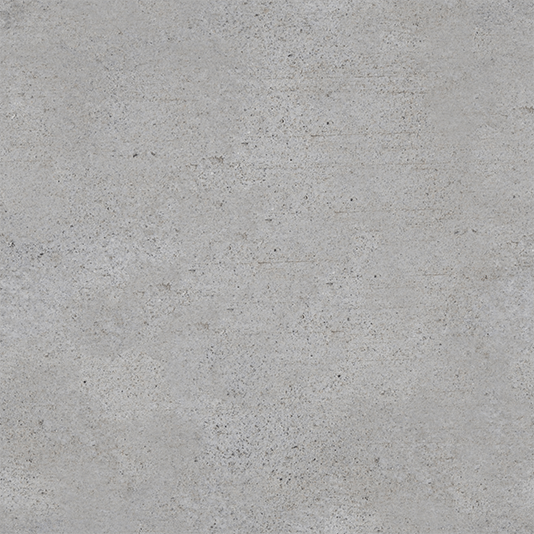 And SILCs may advocate if they have included language about advocacy in their State Plan for Independent Living. 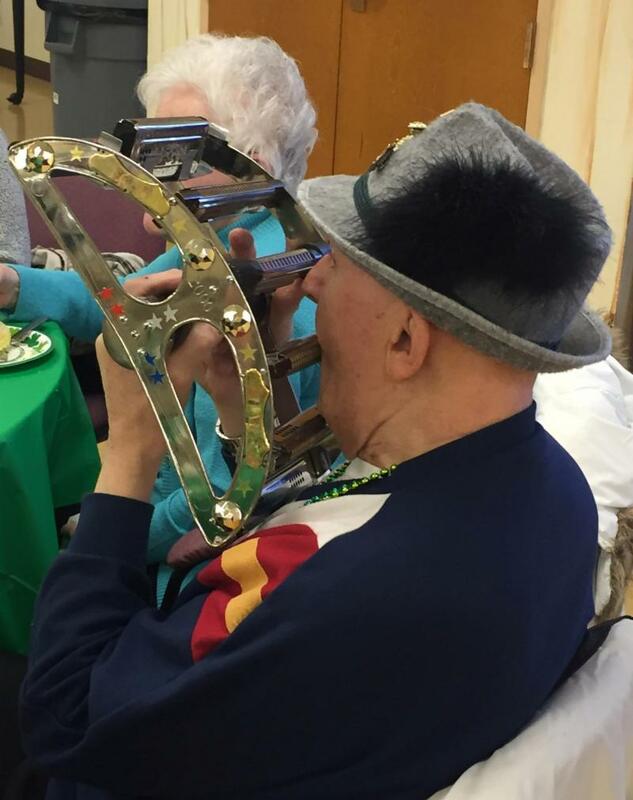 Bob Schmelcher joined the St. Patrick's Day Celebration at the Smith Center on March 16th with a musical instrument that he built himself. The RCIL staff and other attendees of the event enjoyed his music and were fascinated by the contraption as they ate corned beef and cabbage and played Irish-themed games. In the "It's a Small World" category, Bob and his wife Shirley ran into RCIL's Amsterdam Site Director, Lisa Mastracco, at the event. It turns out that 27 years ago Lisa and her husband bought the house that Shirley's parents owned. They had not seen each other in all that time, but Bob and Shirley drove past the old house from time to time and admired the work done by Lisa and her husband to update the home. The house was demolished not long ago after flooding damaged it beyond repair, but Bob, Shirley, and Lisa spent some time comparing notes and reminiscing about times spent in the home they all loved. 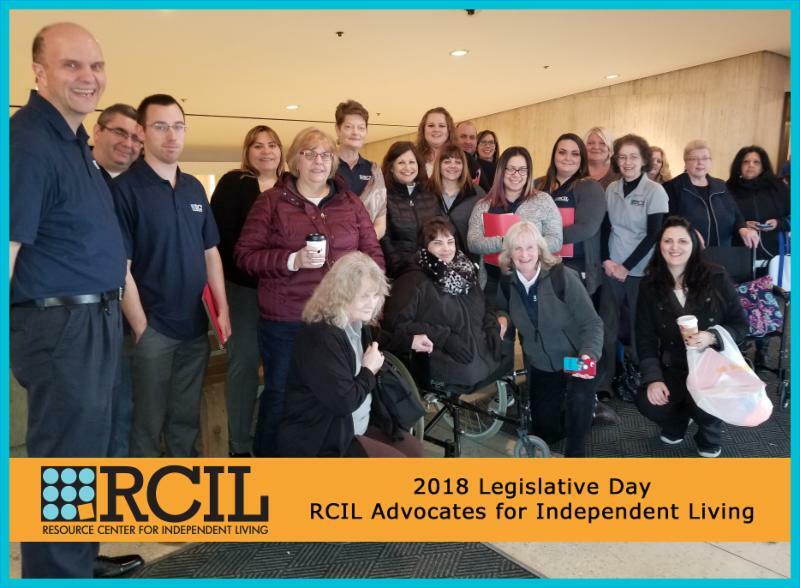 This year, many RCIL staff members made the trip to Albany to discuss issues that impact individuals with disabilities with our representatives in New York State government. All RCIL employees are welcome to participate in this valuable advocacy experience. If you were not able to attend this year, consider making it priority to join the group next year! Due to years of advocacy by affected people and groups representing individuals with intellectual and developmental disabilities, the NYS Office for People with Developmental Disabilities (OPWDD) has issued guidance that clears away an obstacle faced by participants in the Self Direction program. As of March 8, 2018, OPWDD has removed the "community class paradox" that has prevented participants in the program from reimbursement for community class participation when the class did not also have individuals without disabilities in attendance. Proving that individuals without disabilities are in attendance is problematic since Self Direction Fiscal Intermediaries would not have access to the disability status of other participants. This is great news for all Self Direction participants. Nick Cappolettic, CEO of Advocates, Inc. and the father of an individual with developmental disabilities, called it "a wonderful example of parent advocacy at work." Also celebrating the news are Jim Karpe and Brad Pivar, members of the StateWide Advocacy Network of independent parent groups, SWAN, who see this change as a way to make the Self Direction program a more attractive option for individuals and their families. The new guidance can be found on the OPWDD website: OPWDD Self Direction Guidance. For more information about the Self Direction program, please contact Amanda Tuthill, Program Director, at 315-797-4642 ext. 2917 or email Amanda Tuthill. On Friday June 1st, The Ride for Missing Children will be embarking on its 22 nd annual event. 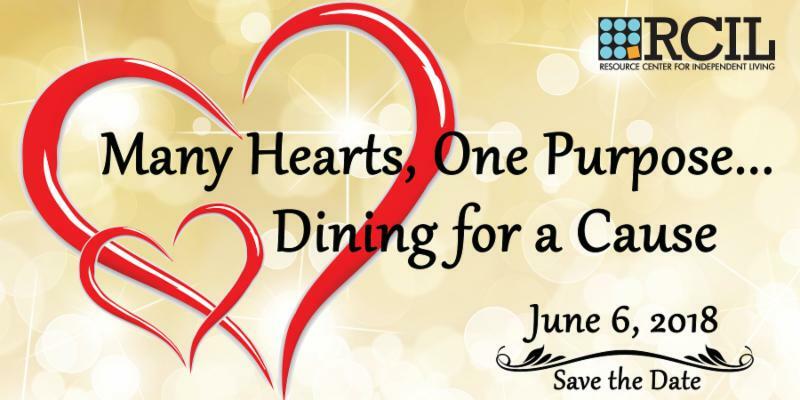 To raise funds to support the missing children poster distribution, community education for the prevention of child abduction and sexual exploitation, and the mission of the National Center for Missing and Exploited Children - New York/Mohawk Valley (NCMEC-NY/MV) in serving our community here and across New York State. The Ride is a one-day, approximately 90-mile bike ride that stops at schools along our route to bring a message of safety. All participating Riders make a vow to raise a minimum of $500 and to support the mission and goals of the NCMEC-NY/MV. Visit the event website to register or for more information: The Ride for Missing Children. Support our own Kat Ingersoll (315-797-4642 ext. 2560) as she rides once again in this important event. RCIL is offering free shredding services to all of its employees from April 16th through April 20th. Bring your sensitive documents to any of the RCIL offices and place them in the big, gray bins. Our shredding company will shred your documents onsite. 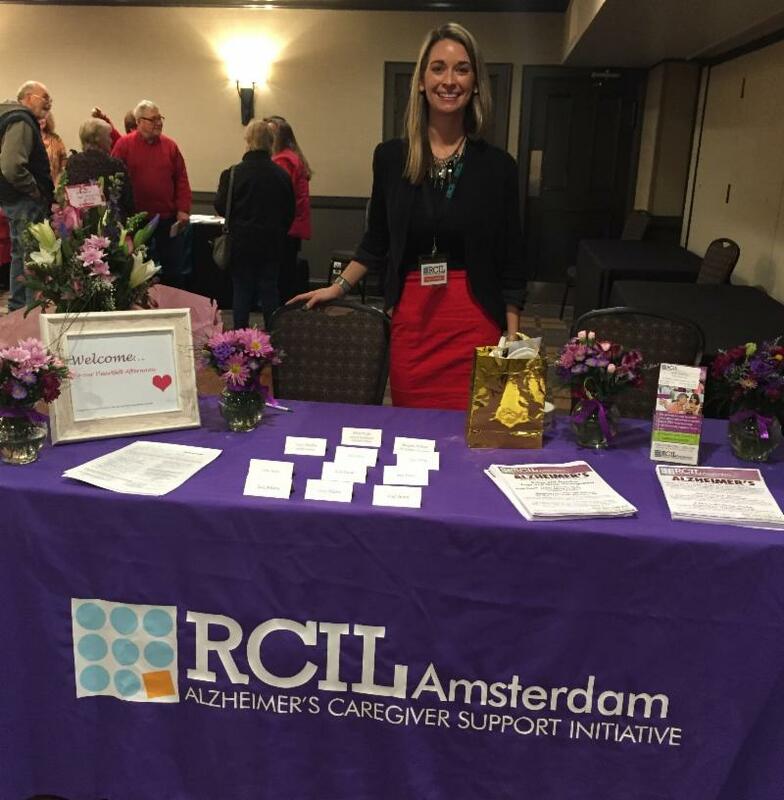 Program Coordinator, Jamie Marshall, led the RCIL team in an event for caregivers and individuals with Alzheimer's Disease or other dementia in Johnstown. Pampering was the word of the day as attendees were treated to a lunch buffet and free chair massages. Each person was given a raffle ticket with a chance to win a one-hour massage from Bliss Massage Therapy. Raffle tickets under the plates were used to give away the beautiful flower centerpieces provided by Sacandaga Flowers & Events. RCIL and its community partner agencies set up outreach tables to provide information about locally available support services. Partners included the Fulton County Office for the Aging, NY Connects, The Alzheimer’s Association, The Eddie, Catholic Charities, and Albany’s Center of Excellence for Alzheimer’s Disease. Everyone mingled and met new people who share the same life experiences as they do. It was rewarding to see all of the smiling faces in the room, knowing that they were enjoying time outside of their homes with the ones they love. This event was part of the Alzheimer's Disease Caregiver Support Initiative supported by the NYS Department of Health. For more information about this project, contact Jamie Marshall at 518-842-3561 ext. 7620 or email Jamie Marshall.